The winner of the match will take to the semi final which again will be broadcast by RTM. It either on TV1 or TV2. They have you cover up for the most anticipated matches. This is the main reason to cut the budget by not broadcast group matches rather than to broadcast all the matches in quarter, semi and surely the final match. Quarter Finals qualified squads are Brazil, Colombia, France, Germany, Netherlands, Costa Rica, Argentina and Belgium. 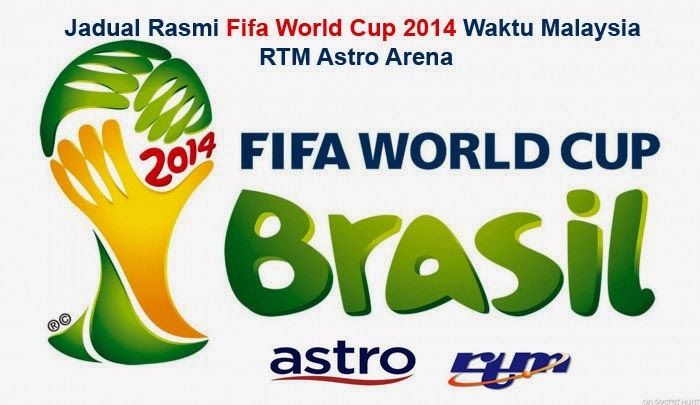 RTM chose to broadcast one LIVE match with a delayed live match in this two-days quarter final World Cup 2014. On July 5, Malaysian could tune to RTM 1 or RTM 2 for 2AM delayed live match between France vs Germany. On same day the match Brazil vs Colombia is a LIVE broadcast by RTM. As for July 6, the match between Argentina vs Belgium is a live match on 12AM. Besides, Netherlands vs Costa Rica is a delayed live match on 6AM. Embrace yourself for the groundbreaking football matches by powerful squad performance. You will never get your time wrong as long as you wait at 12AM on this Saturday and Sunday. If you still afraid there will be a last minute changes which could be possible. Bookmark this page or share to your Facebook timeline for quick read update. More about "FIFA World Cup 2014"